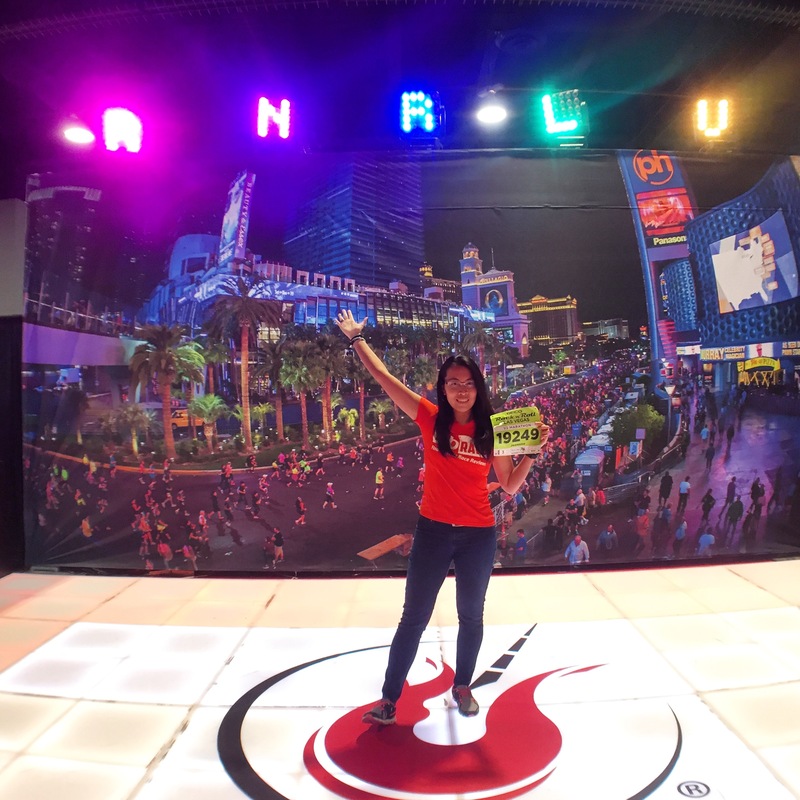 Disclaimer: I received a free entry to the Rock n Roll Las Vegas Half Marathon as part of being a BibRave Pro. Learn more about becoming a BibRave Pro (ambassador), and check out BibRave.com to review find and write race reviews! I’ve been to Las Vegas 3 times and I’m always in awe of the Strip. Each hotel feels like its own city, filled with restaurants and attractions. 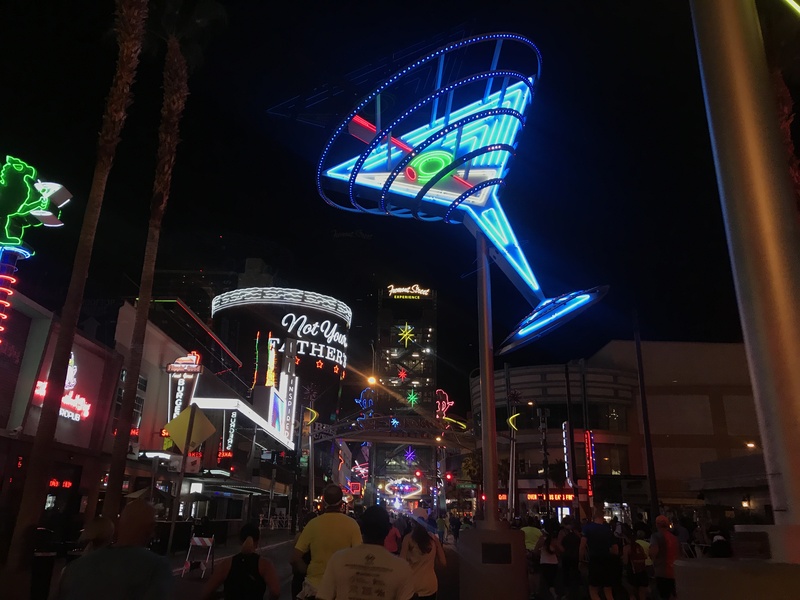 The bright video screens, neon and loud music create such a vibrant atmosphere along the boulevard. No wonder this is called the “Entertainment Capital of the World.” Now imagine adding a running race to that mix. Does that sound epic? I’m telling you now, it is. I heard about the Rock n Roll Las Vegas races and they always intrigued me. 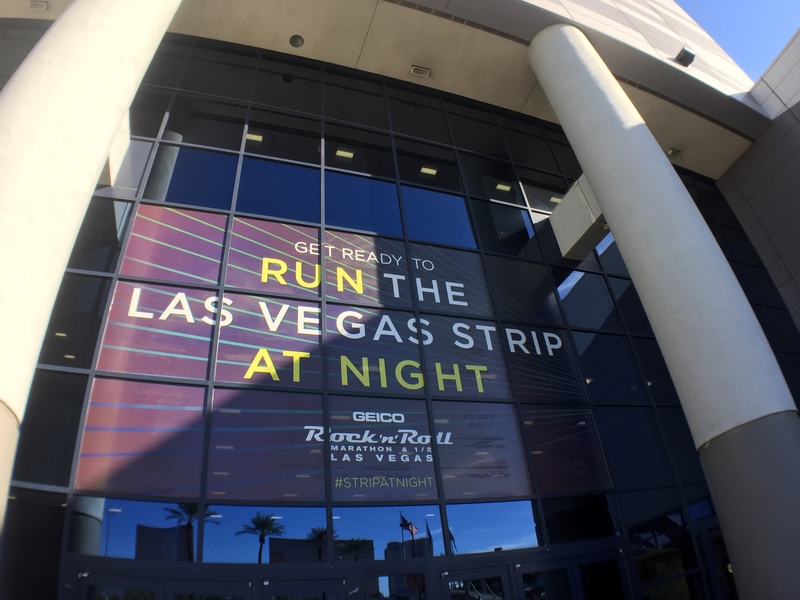 Why, because you run the Strip at night! I’ve always wanted to experience that. 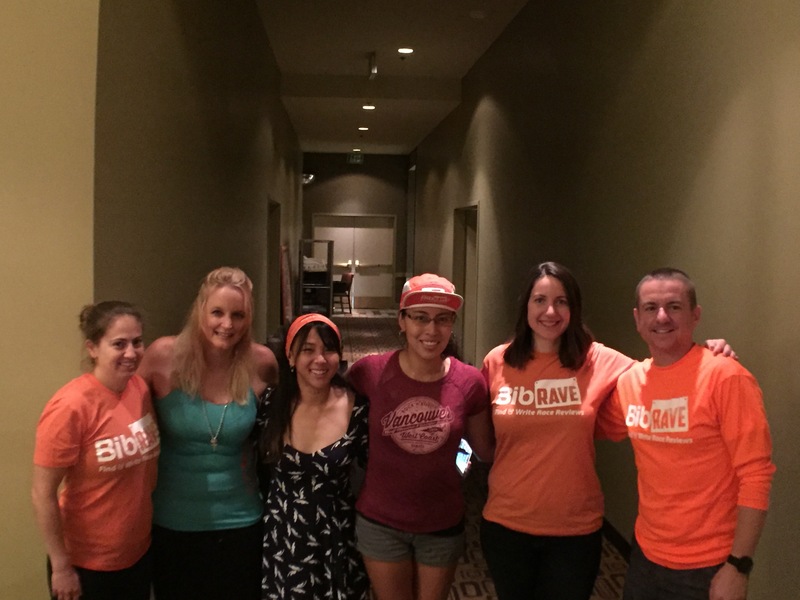 When the opportunity came up to represent BibRave at the race, I immediately made travel plans. The weekend event features a 5k on the Saturday and a 10k, half marathon and marathon on the Sunday. As with other RnR races, you had the opportunity to earn the Remix medal if you run both the 5k and either race on Sunday. I opted for just the half marathon. If you like straight and flat courses, this race is for you. It’s basically an out and back. You first run south past the Las Vegas sign. 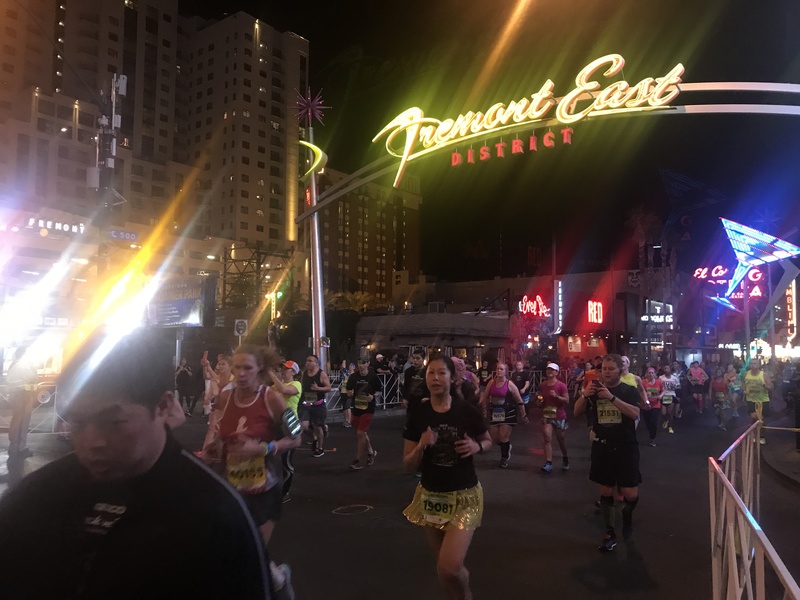 Afterwards, you double back and run towards Downtown Las Vegas and turn around at Fremont Street. You then keep running back towards the Strip and end at the Mirage. Live entertainers lined the course for what seemed to be every couple of miles. 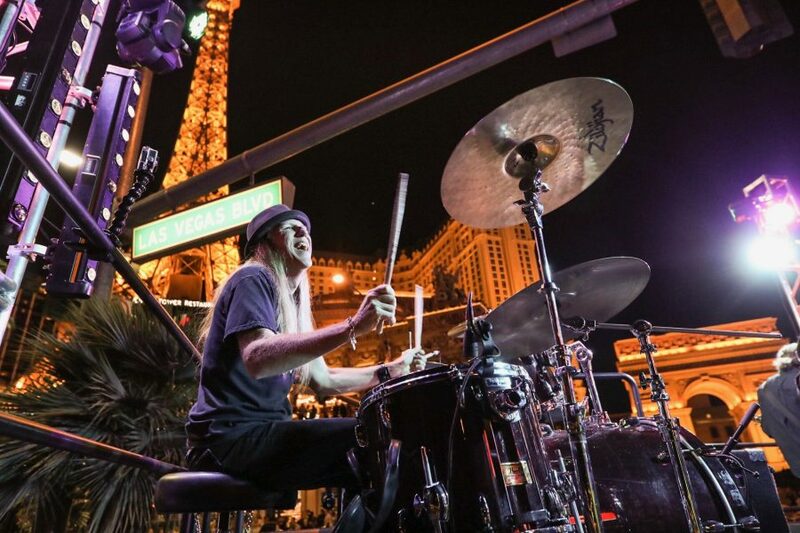 The bands ranged from a string quartet to DJ’s to an “Elton John” performer and a KISS cover band (among others). 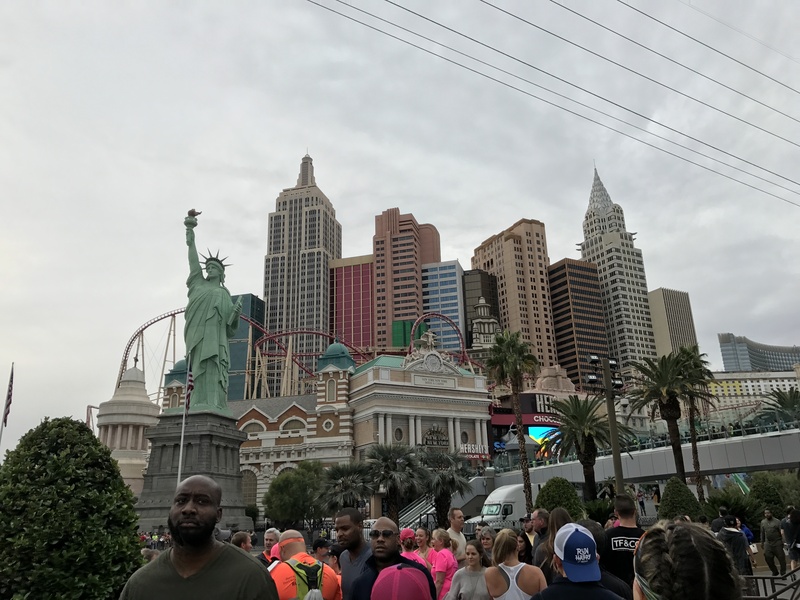 What you need to remember about Vegas is that landmarks appear closer than they seem. With such a straight course, you can also see landmarks from miles away. That included the finish line. It’s a mind game you have to get over. New start line location in front of New York New York – This worked in my favour since I stayed at MGM (across the street from NYNY). 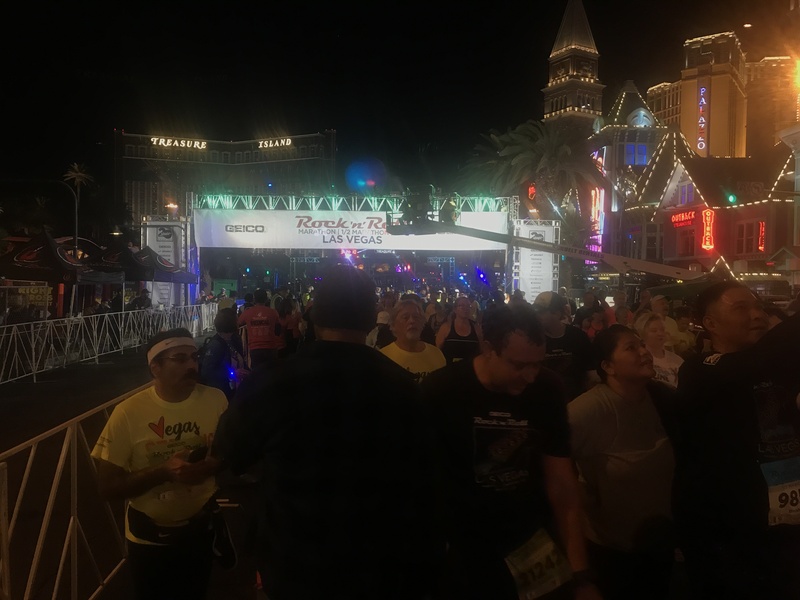 It was still about a 10 minute walk to the runners village but had it been out by Mandalay Bay, it could’ve easily taken me 20-30 minutes to walk there. 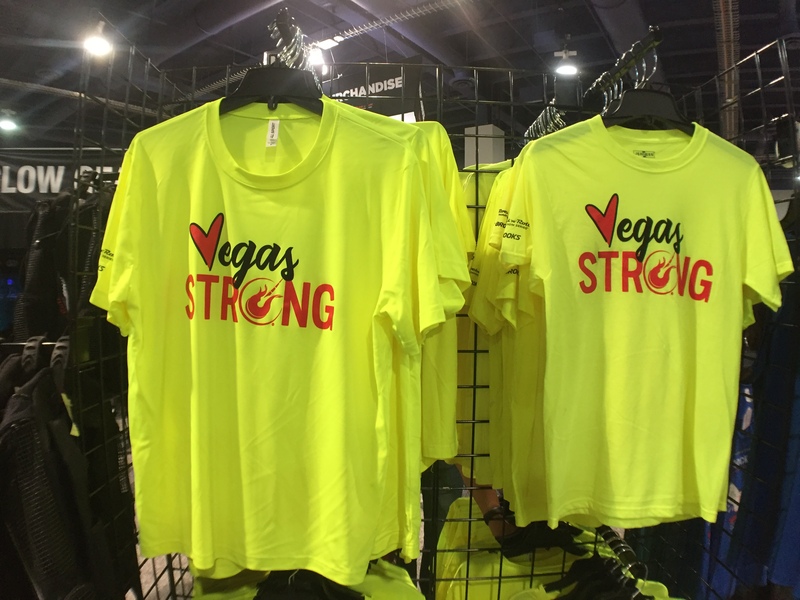 The first 2.5 miles of the course had no amplified bands as a sign of respect for the victims – The signed #VegasStrong walls from the Runners Expo were also illuminated near Mandalay Bay. My heart hurt running through here knowing the tragedy that happened. It was great seeing the community come together though. We’re not letting fear win. 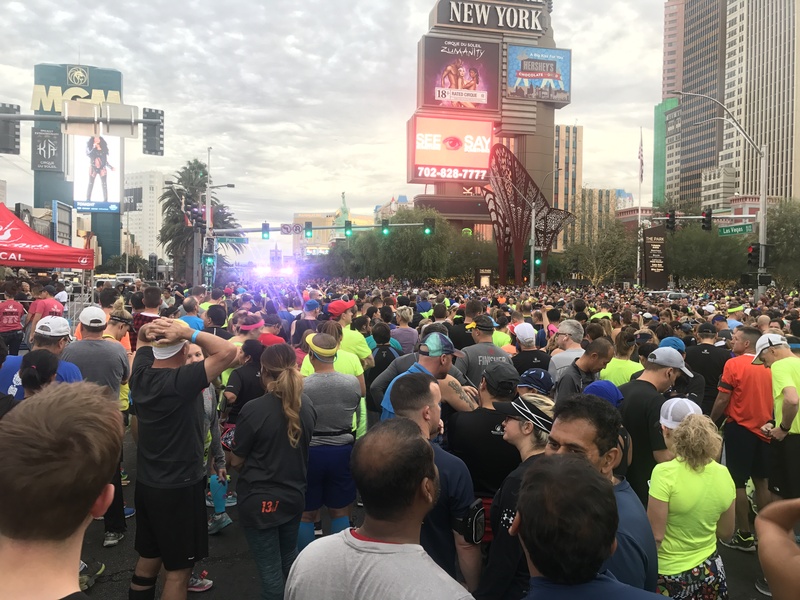 The Goo Goo Dolls headliner concert was moved to Saturday night after the 5k instead of before the half marathon/marathon start. – I’m bummed about this change. I made dinner reservations on the night of the 5K months ago and thought that I could make it to dinner AND the concert. Unfortunately, we arrived at SLS Station at 8:30 and a large crowd of runners greeted us outside the monorail. The concert was clearly over so we decided to turn back. I hope they keep this change though. Normally, the 10k runners won’t even get to see the concert since their start line is somewhere else. Having it after the 5k gives all participants to show up if they want to or not. Our flight landed on Saturday so as soon as we checked in, we went straight to the Las Vegas Convention Centre to pick up my race package. We stayed at the MGM Grand which is on the monorail line. It allowed us to get to the expo easily. We arrived and it was busy but it didn’t take long for me to pick up my race package. There were hardly any lines at bib pickup and t-shirt pickup. We were then led to the big Brooks area where you can get official race merchandise. One of the booths that caught my eye was the Toyota booth. 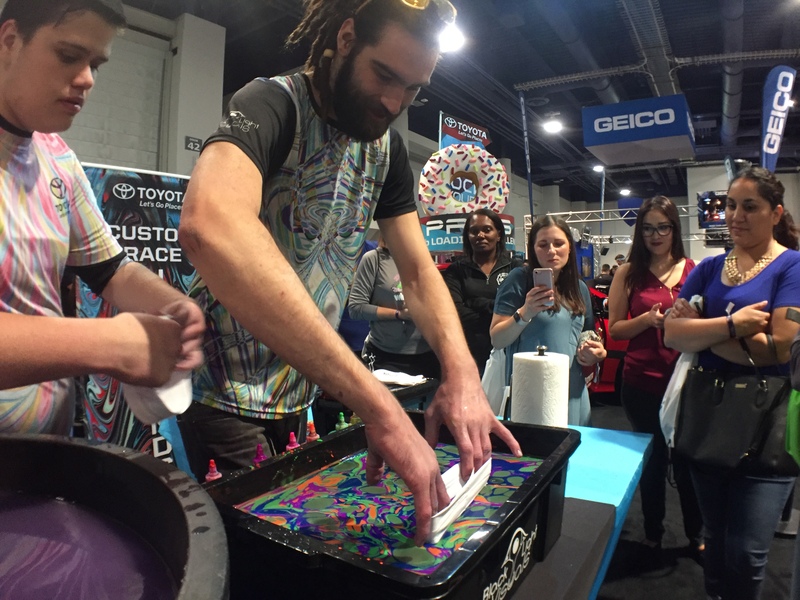 They hired this company (from Detroit, I believe) to create custom dyed headbands for runners. It was a neat process. 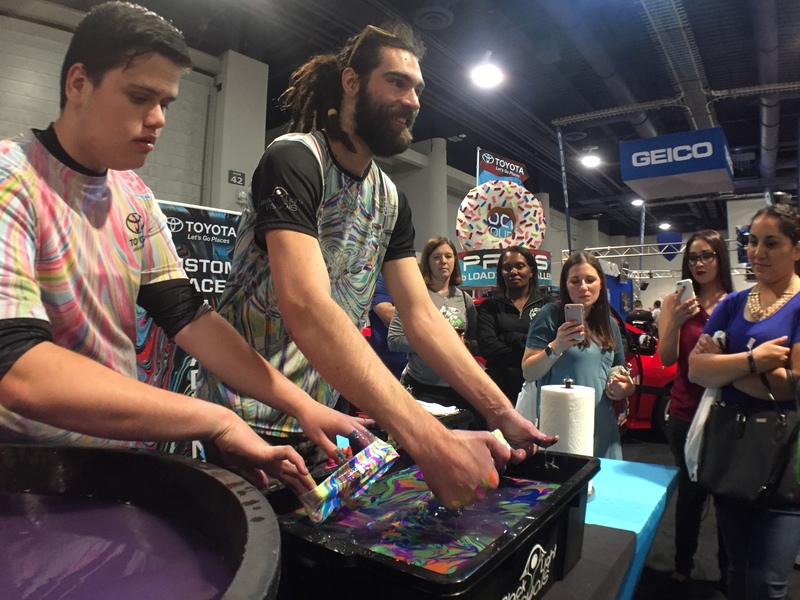 One bucket had water (or some type of liquid) and they put different colours of dye in and swirled it around a bit. They then dipped the headband and when they took it out, a colourful pattern was formed on the headband. They then dunked it in the other bucket to (I guess) seal the colours. I would’ve gotten one but the line was so long. Great swag! There was also a large #VegasStrong signing wall where people can leave their tributes and messages. 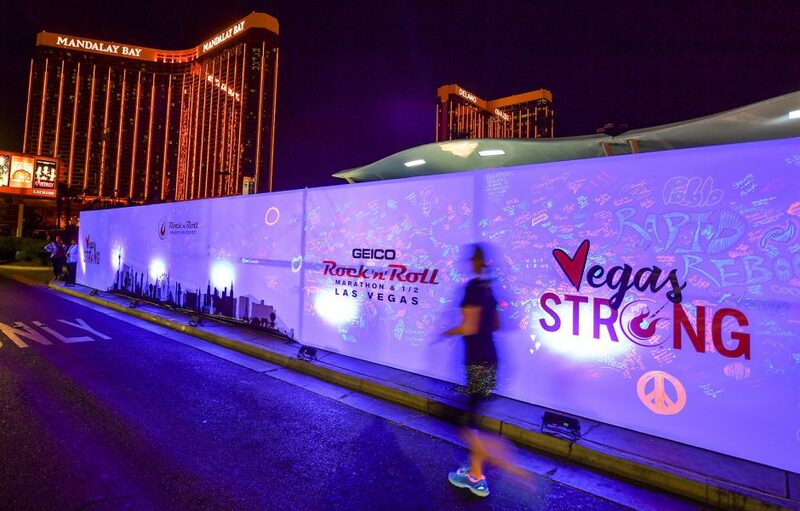 This wall was moved to the race course by Mandalay Bay and illuminated. We then went to the Rock n Roll merchandise section and I got a tank top and a shirt… $10 each! I was pretty happy with that find. I came out with some pretty nice souvenirs! The longest lineup was for the big photo wall near the entrance. There were some large groups that took forever taking different combinations of photos but eventually, I got my photo. We left right after. The day started off with a brunch with the BibRave crew. Justin, Christine, Allison, Mai, Fallon and I met up at the buffet at Planet Hollywood. It was great meeting all of them in person since I’ve been looking at their Instagram photos and Bibchatting with them every week for pretty much a year. 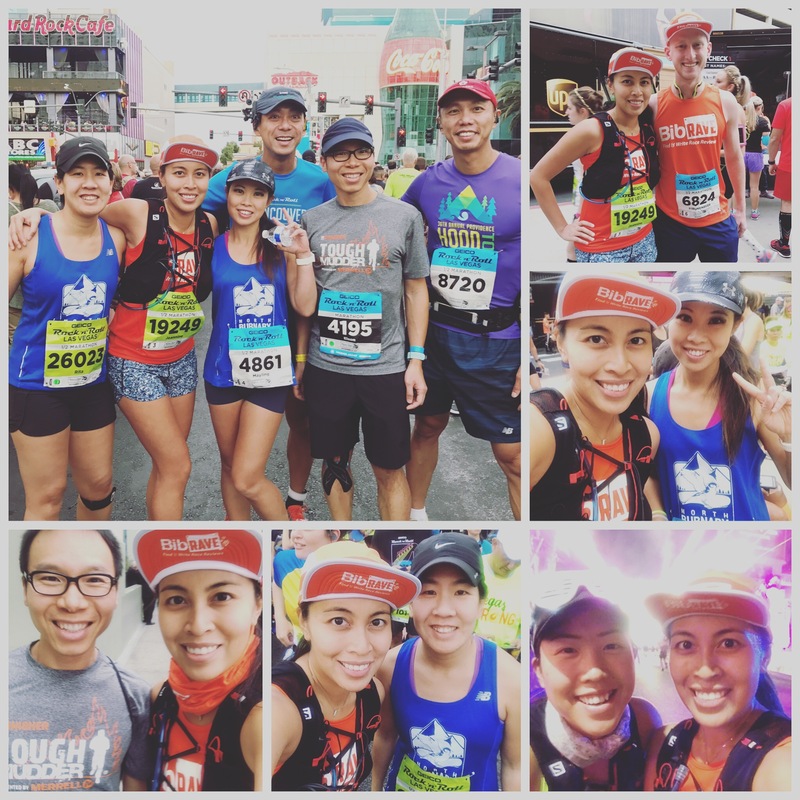 We chatted about running (obviously) over waffles and eggs. Definitely had to fuel a bit differently for a night race. Ryan didn’t make it to brunch but he managed to find me at the Runners Festival, which was awesome! I was also lucky to meet up with the North Burnaby Runners at the Runners Festival. We all met up at Gear Check and took so many photos. I liked the Runners area. There was a lot of space for us to hang out. 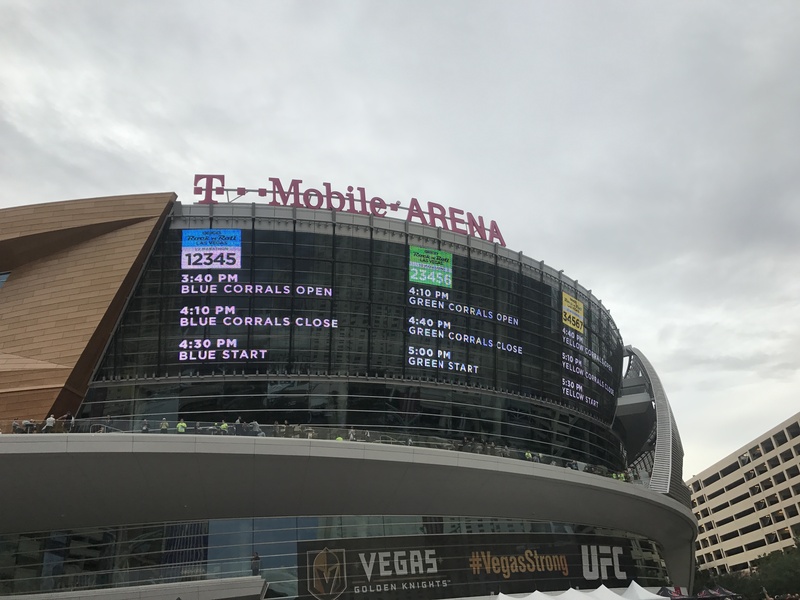 They used the T-Mobile Arena exterior facade to alert us when corrals would open. Water and fruit were handed out in case we needed it and washrooms at nearby hotels were available for use. I was seeded in the Green Corral with Rita from NBR. We hung out waiting for our 5PM start time. There was a big police presence (on foot, horseback, and air) which wasn’t a huge surprise. 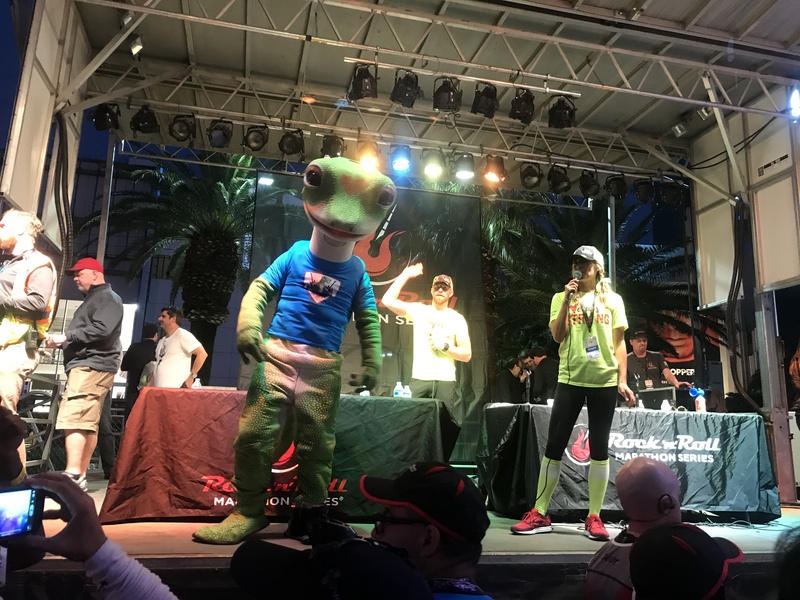 The emcee and the Geico Gecko entertained the crowd until they sent us on our way, but not without setting off some pyro at the start gate. The first half started off great. I ran well for the first 10k but unfortunately I was plagued with stomach problems for the second half, which made things a bit uncomfortable. I’ll leave it at that but I decided to just run the race for fun at that point, rather than time. 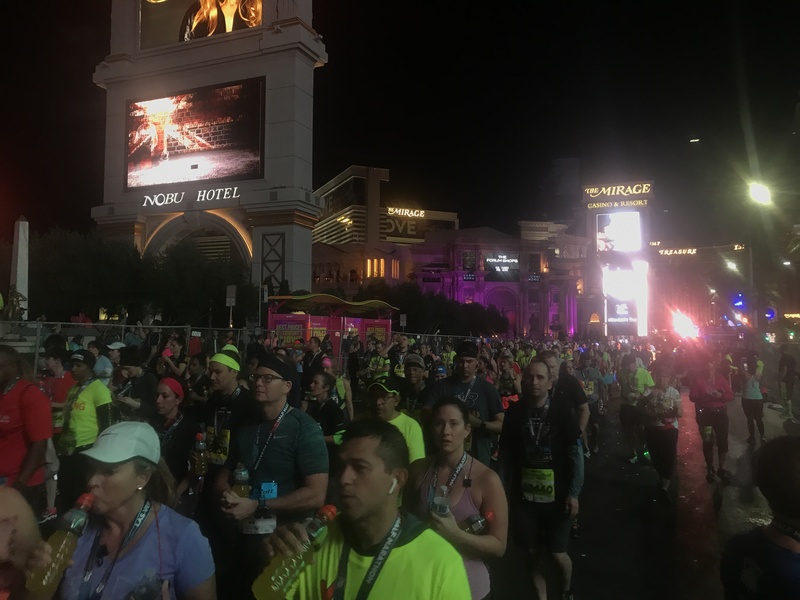 My favourite part of the course was the main drag of the Strip, from Mandalay Bay until the Wynn and Encore. Most people lined the street to cheer and all the bright lights, hotels, and dancing fountains were interesting to look at. 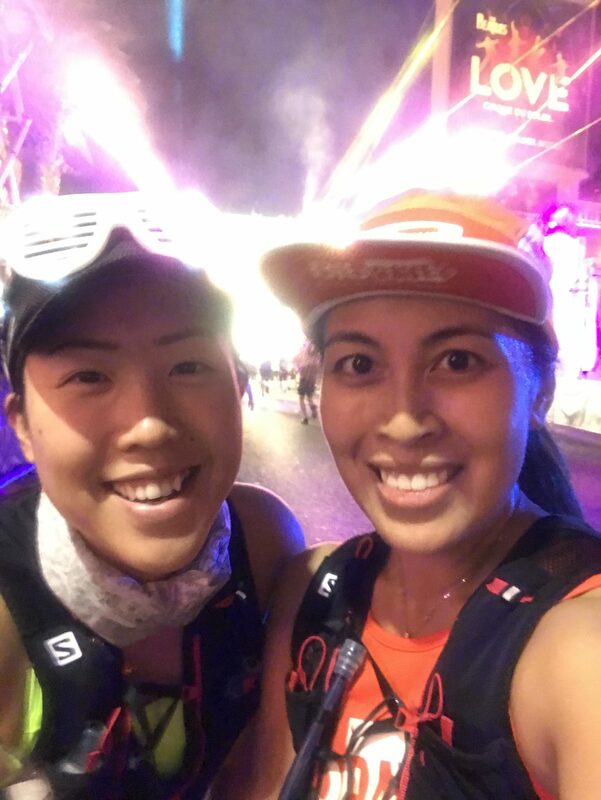 The darkest part of the course was the first few km heading south past the Las Vegas sign and back north until you hit the strip again. I was careful not to get caught in some of the cracks in the road. 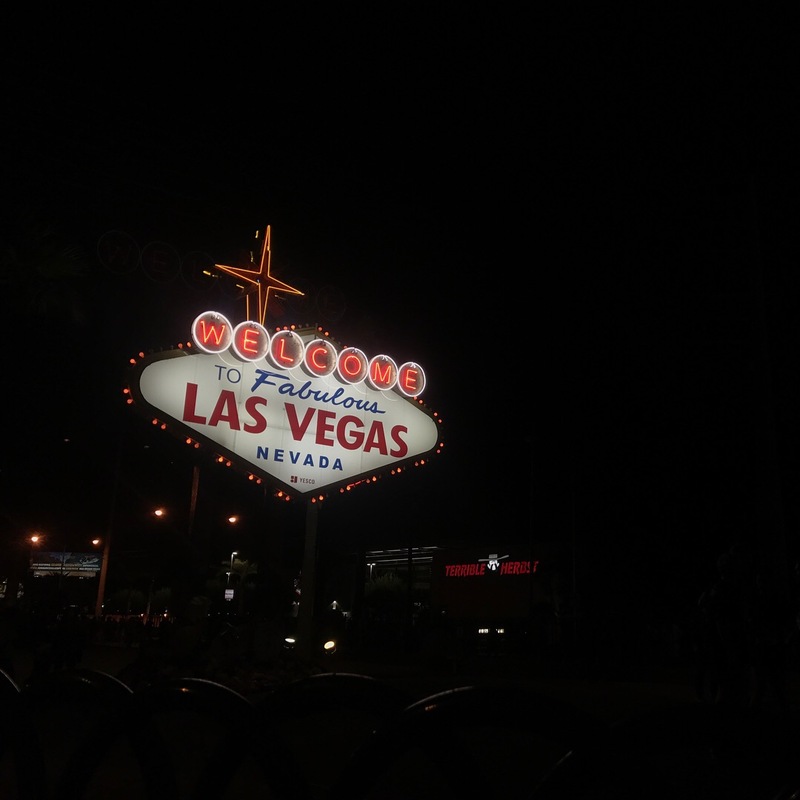 The Downtown Las Vegas part was also a bit quiet, with not as many people cheering. It was still interesting though since you get to pass a bunch of wedding chapels and the pawn shop from Pawn Stars. Rounding Fremont Street was quick but it was nice to see some old school neon for a little bit. Meters from the finish line, I saw a familiar face. It was Barb, already partying with a beer! We had been missing each other all weekend and I finally found her near the finish line. As you can tell from the photo, the finish area was electric. It really felt like a celebration when you finished! The medal is fantastic. 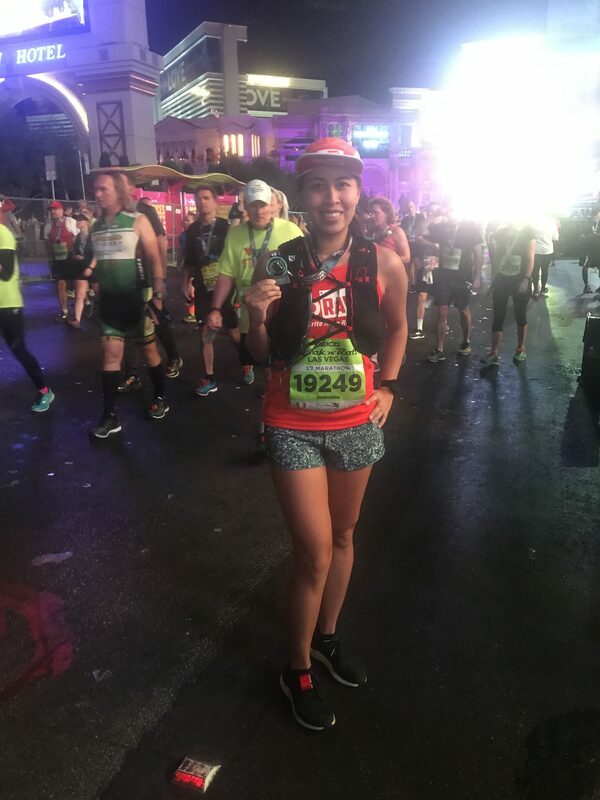 I mean look at this… There’s a reason why Rock n Roll Marathon Series medals are collectors items. Fuel smart – I didn’t and paid for it. I know it’s tough to find but try to order the healthier items and I would recommend eating an energy bar before the start of the race. You can see landmarks from miles away – the course is so straight so don’t let this play tricks with you. Always think, everything is further than they seem… sometimes miles away. Make reservations for restaurants in advance – the hottest places book up months in advance. To ensure you have a table, book early. Most restaurants accept walk-ins though if you’re not picky. Book a Grand Canyon tour – I booked a VIP South Rim Grand Canyon tour with GC Tours the day after the race. Amazing experience, excellent guide and I didn’t have to drive. 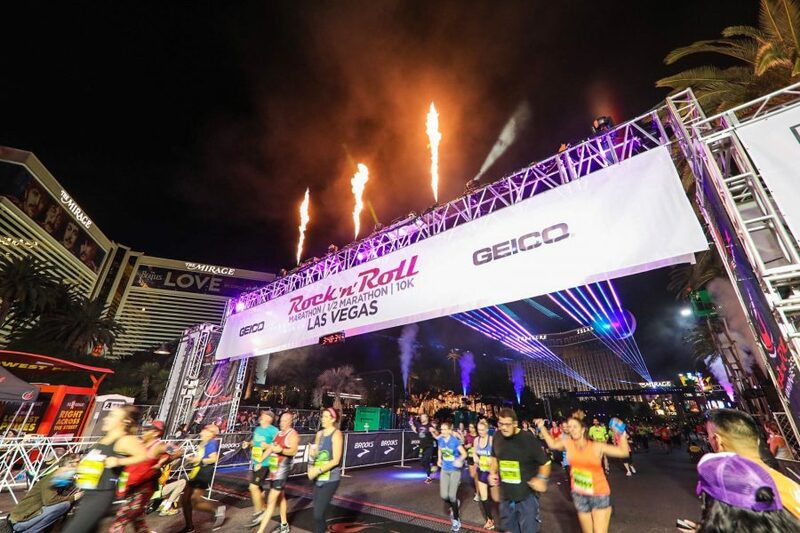 Use the RnR Runners Perks – Rock n Roll Las Vegas runners have special discounts including multi-day monorail passes, restaurant discounts, and show discounts. Nothing wrong with saving some money! Organization – For the most part, the race organizers were great. Everything was clearly laid out on the website. Unfortunately I didn’t receive the last email prior to race day, which had some pretty important information. That must’ve been a glitch in the system but as I said, the website was great and I found all the info I needed there anyway. I did bring it to their attention on Twitter and they replied to me promptly, which I appreciated. Expo – Package pickup was very easy and efficient. There was a big variety of running brands there and some booths had sales. Unfortunately not on the brands I like. Course – straight and flat but can be crowded at times. It can also be dark when you’re off the strip but headlamps aren’t necessary. Next time I’d wear glow necklaces or bracelets or something fun. The on-course entertainment was fun to watch and listen to. It also seems that they change bands at certain spots. I wanted to take a photo of the KISS cover band but when I saw their stage the second time, they were replaced. Oh well! 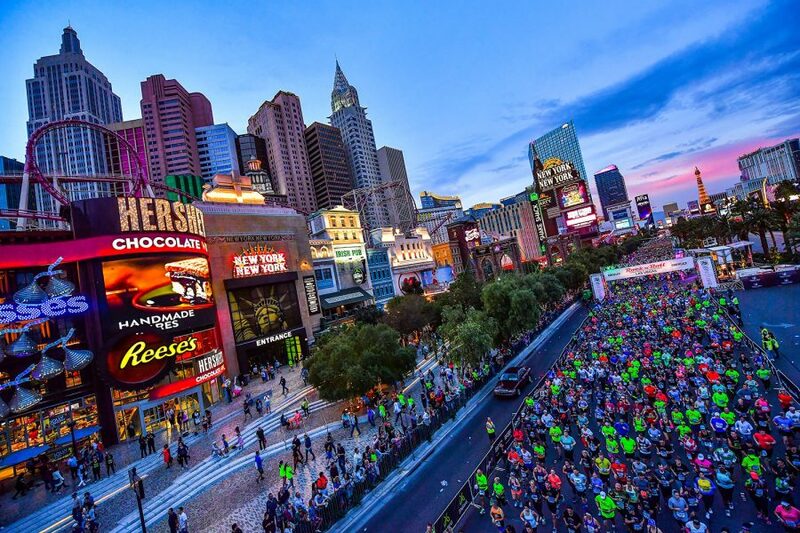 Running on the main drag of the strip was the best part of the race though. 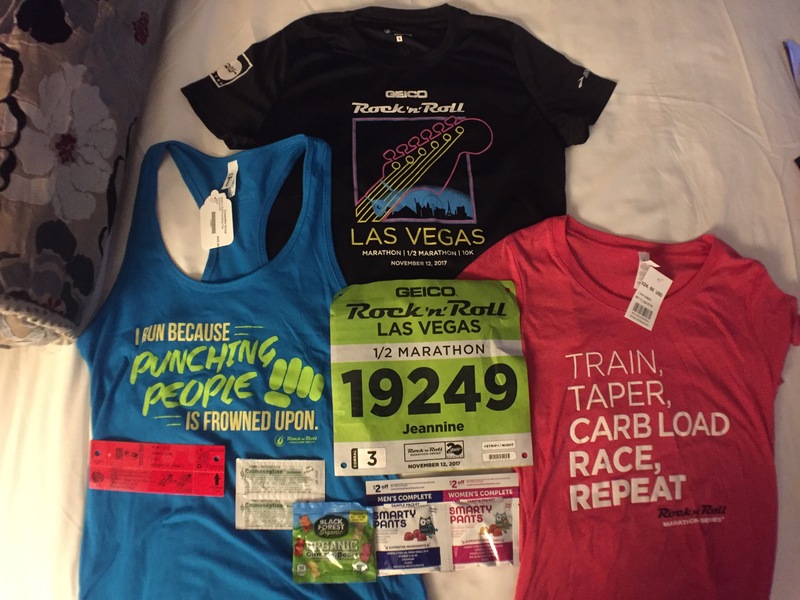 Swag – I love the race shirt and the medal. I would wear the shirt again easily and the medal is just cool because it glows and spins multiple ways. Definitely a great keepsake. Would I Do It Again? Yes I would. I’d love to go back with some friends and run this race and do the Remix this time. I’d also arrive a day earlier so I’m not so rushed. 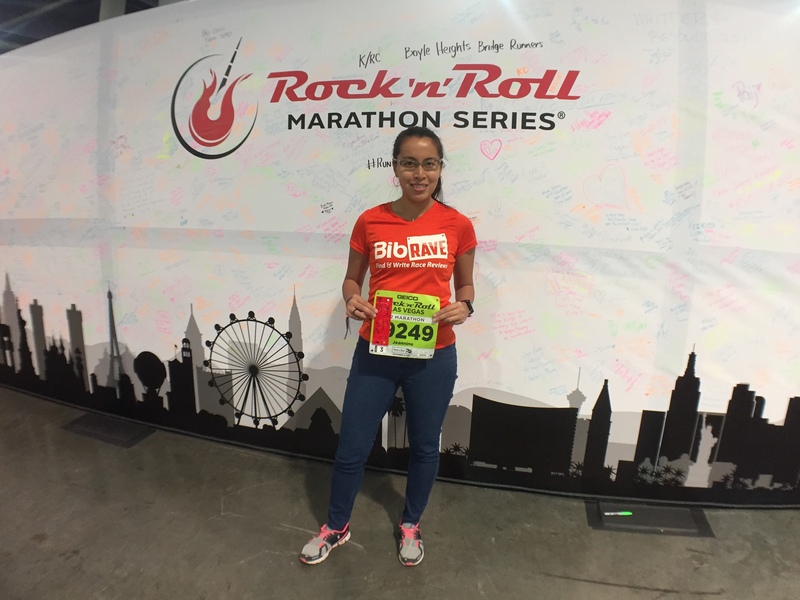 Thank you Rock n Roll Marathon Series and BibRave for an epic racecation! Did you run this race, or any other race? Don’t forget to review all your races on BibRave!